Some may say that it is “brave” to cast middle-aged actors as leads nowadays, but probably not so risky anymore as the succession of some recent successful films shows, such as “Amore” (2012), “The Best Exotic Marigold Hotel” (2011), “Hope Springs” (2012) and “Quartet” (2012). 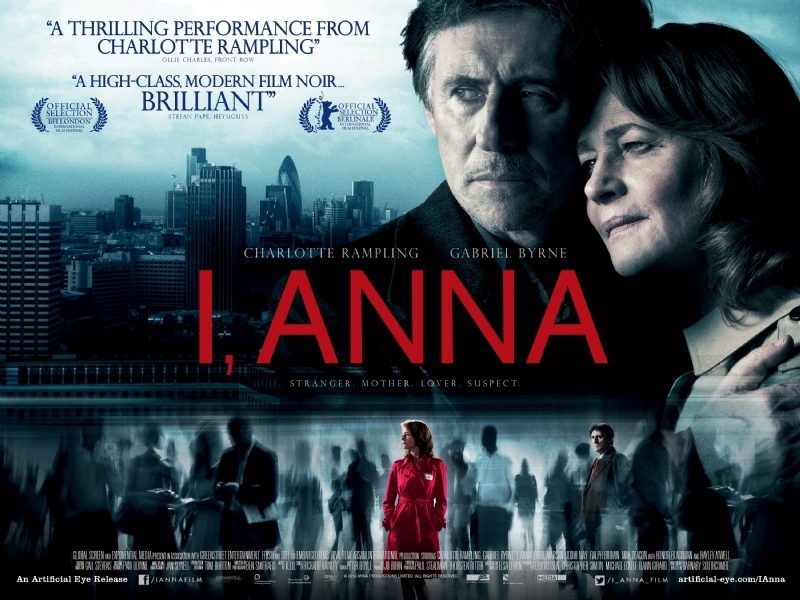 The first thing to note is that Gabriel Byrne and Charlotte Rampling give magnificent performances in “I, Anna“. Byrne provides so much charm that one wonders whether he would ever grow out of it, and Rampling balances her natural reserve with inexplicable emotional intensity, which permeates the film to its core. However, what is the most striking is, probably, Rampling and Byrne’s interaction – their chemistry on screen is great and it becomes the point of a special interest to see them together on screen. Rampling, playing an innocent victim/cynical seducer is more than capable of leaving Byrne (Detective Reid) gasping for breath. In terms of plot, however, it is rather slow to take off. Although “I, Anna” is not unintelligent (there is a twist in the movie), the UK production is still unable to live up to some of the Hollywood’s mind-twisting and brain-boggling plot lines that viewers are increasingly being accustomed to, thanks to such directors as Christopher Nolan and David Lynch. The film definitely has a potential to be something special, but, as the movie progresses, it somehow becomes doubtful whether “I, Anna” and its plot complexity are sophisticated enough to emerge from a place where only late TV drama series dwell. Having said that, although “I, Anna” does not quite cross the threshold of a jaw-dropping awe, it is thought-provoking and keeps the tension until the very end. The film does get better as it progresses, but this maybe as the result of an unveiling psychology behind the main heroine and her actions, rather than due to anything else. As the audience starts to understand the main heroine’s motivations, i.e. her need for intimacy and her past actions, the film eases into being a fascinating character study, capturing the viewers’ attention on that basis alone. And, although Byrne does not really provide the required depth of intelligence and philosophy to match “The Usual Suspects” (1995), he does project enough mystery to carry the film successfully to the finishing line without giving much away. Some parallels could also be drawn with another film noir “In the Cut” (2003), starring Mark Ruffalo, Meg Ryan, Kevin Bacon and Jennifer Jason Leigh. “In the Cut” is similar to “I, Anna” in that, in the former, a woman suspects a man she is romantically interested in to be a gruesome serial killer, while, in “I, Anna”, the reverse seems to happen and a man becomes romantically involved with a woman who is considered to be a prime suspect in a murder investigation. Some commentators have also complimented “I, Anna” for its use of location: it centres mainly on the Barbican area of the central London. The location definitely is in-tune with the nourish atmosphere of the film: the Barbican estate is anything but a pretty site (so corporately gloomy it is) and, coupled with London’s grey skies, makes for quite a picture. However, this inevitably means that “I, Anna” becomes more depressing as a film than the director probably intended it to be, and whether it is a good or bad thing is for the audience to decide. If London’s Barbican area does not provide style and glamour, it certainly emphasizes urban drabness and the claustrophobia of a modern life. Unusual photography and cinematography add to the impression of the film being so murky; and the surprising choice of a soundtrack makes the film appear “artsier” and more “underground” than it actually is. Top 10 film noirs of all time list will definitely include a big bunch of 1940s films. ‘The Big Sleep’ is a very good starting point, possibly followed by ‘Laura’, ‘Out of the Past’ and ‘Night and the City’. These films are basically classics. Starting from mid 1970s there is no strict genre of a film noir and this genre tends to be combined with others. The ‘modern’ list won’t probably do wuthout a couple of films from David Lynch and Coen Brothers, and I would personally include both ‘Drive’ (2011) and ‘Collateral’ (2004). Many thanks for the reply. I’ve seen The Big Sleep but none of the other 40s films you mentioned. I’ll look them up. Yes, Blue Velvet and Blood Simple, I would say! I had never heard of this film, but love both these actors and will seek it out. Thanks for your review!